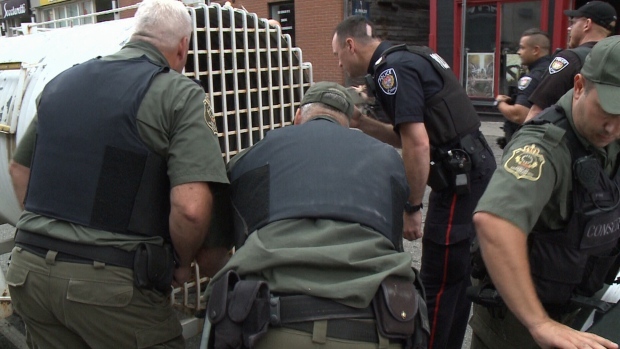 Ottawa police says a bear that roamed one of downtown Ottawa's busiest neighbourhoods on Thursday morning is on its way out of the city. Bear sightings are up around the capital region, with 44 already this month, according to the National Capital Commission. The latest sighting happened Thursday morning in Gatineau near Tache Blvd. Police received calls around 8:45a.m. One witness described the bear as a large black bear. “It was a nice big mother bear,” Bill Bourne said. Bourne said he watched if flee into the woods after coming into contact with people. “She saw the woman at the bus stop, a woman and two children, and she turned around and climbed over the fence and headed into area,” he added, pointing to the woods. On Wednesday, a bear cub was spotted near Allumettières and Vanier Road. Police say that bear was put down after it was struck by a vehicle. Richard Moore with the NCC says he’s receiving calls for three to four bear sightings daily. “We still don’t know why (the bears) are doing this, is it because of lack of fruits, berries, or maybe forest fires up that were up in northern Quebec, or Ontario,” Moore said. Moore said it is also possible the hot weather may have dried out natural foods. The Quebec Ministry responsible for wildlife says “the Outaouais is an ideal habitat for black bears, a species commonly seen in this region,” said Caroline Bujold, spokesperson for Ministère des Forêts, de la Faune et des Parcs said via e-mail. As the bears prepare to hibernate for the winter they could be coming into town looking for garbage or other sources of food to store fat for the winter. Never approach a bear, especially young cubs. Remember that black bears will sometimes stand up on their hind legs, but they generally do so to better identify a scent or a source of noise. Don’t shout or make any sudden movements. Talk to the bear in a soft voice and back up slowly until it goes away, or go in a different direction. If the bear follows you intently, face it and try to look imposing. Wave your arms above your head. Talk loudly. Try to intimidate it. Bang a stick against a tree trunk or the ground. This should be enough to scare it off. Playing dead is not recommended, and neither is climbing a tree (since bears are good climbers). Instead, stay alert and be ready to face it in the event of an attack. If the bear does attack, defend yourself with whatever is close at hand.